For quite some time, I’d been looking to replace two very worn throw pillows in our family room. This room’s a high traffic area, right off the kitchen and favored by my three children, I didn’t want to spend a lot. While shopping in Greenwich, I came across two beautiful Suzani pillows that I knew would be perfect, but at $225.00 each, I decided to keep looking. On a whim, I googled the name of the fabric (I took home a “tear sheet” from the shop). I was more than thrilled to see the name of Etsy seller Turquoise Tumbleweed come up in my search results! Not only did this store carry my exact pillows, but they were only $59.00 each! I found so many additional options that I had a hard time choosing, but ended up sticking with my initial choice. I love that they have this textural 3D quality to them. Here is a shot of the old pillow, the new and some more great pillows from Turquoise Tumbleweed, which is really worth checking out… they’re all lovely! the first one is my favorite!!! Thank you so much for sharing! I have a Suzani print in my family room, and I am loving these. Going to check it out!! So I suppose it is quite apt that throw pillows look like they have been thrown! Love your new happy pillow, and the price can't be beat! Yeah, you! I'm off to bookmark that seller for future pillow purchases. My living/family room is in desperate need of some zhushing too. Like how I worked your name in there? Great pillows. I am going to have some made it works out to be about the same cost as yours. I have a bit of a pillow obsession and have to stop buying them. Good for you for not throwing away money! Blue and white is a nice calm combo on a busy pattern and these look great!!! These are great, but pillows won't help our sad den sofa. Time to retire it … and THEN get some new great pillows! I love how new pillows can transform a space- yours is so pretty!! Fabulous! Yet another Etsy shop to add to my Favorites. 🙂 Have a wonderful Wednesday, Sue! I love the new happy pillow! Thanks so much for visiting my blog and commenting! Love yours! I love your new happy pillow! Pillows really add a lot and I often overlook them. Not anymore! One of the BEST blog posts EVER! Isn't this amazing? Love love love your new pillows and they look perfect in their new home. This story is one of the reasons I hope to sell my jewelry myself as the retailers mark-up is SO high I feel like, as a designer I'm being ripped, but the clientele is so limited. 210% markup in some stores. I working to make this successful, and will forage on into more styles on Etsy. Love you, Sue. Thanks for your comment on my blog. I love yours – you have great style! The new pillow looks fab – enjoy it. It pays to do your homework! Love the pillows–they are gorgeous!! I purchased a similar fabric at onlinefabricstore.net for about $38 a yard. I love the fluffy center. 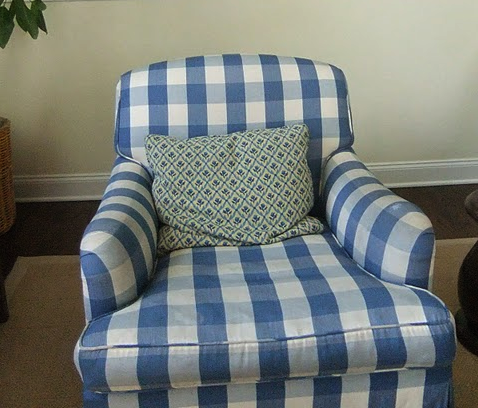 Your pillow looks great on your blue and white checked chair. $225 for a pillow…give me a break! My last several pillow purchases have been from Etsy. Great prices, great selection. Now it is on my must check before I buy list. Yours look great! Such pretty fabric!! Love the blue ones you chose! YOU are brilliant and quite a sleuth! Your chair has a whole new look – and you are such a good little shopper!!! Might have to bounce over and take a look for myself! Your new pillow looks fabulous and I adore the red one too! Cute, I adore these bright pillows! 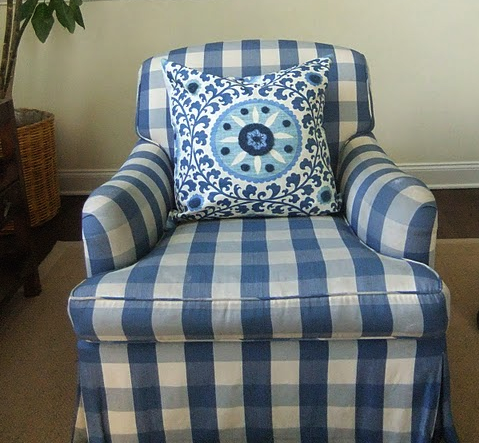 Love your new Suzani pillow = add just the right punch to your lovely chair. And good for you for your successful investigatory work!! Will have to pop on over there and check out her assortment!! i always turn to throuw pillows when i want some cheap and quick change in our bedroom! love the first one! I just love love love ikat! The new blue pillow looks great!